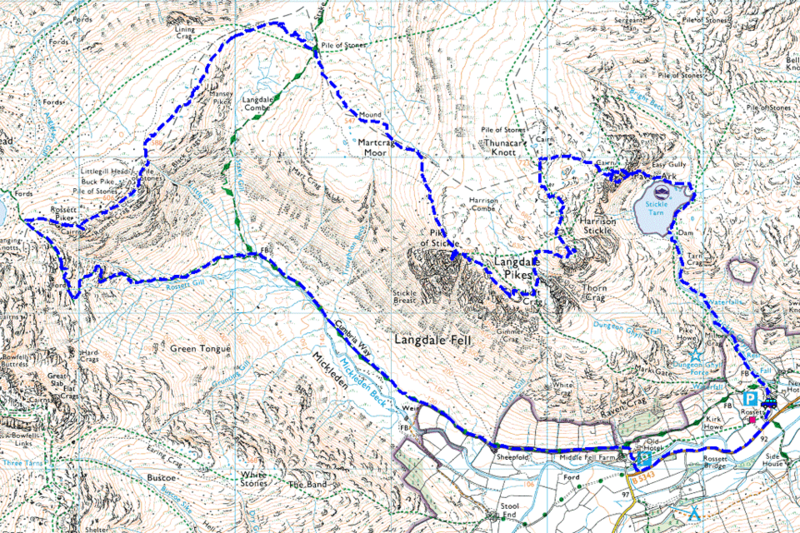 Summer returned today with glorious warm sunshine as I walked the Langdale Pikes and Rossett Pike. Stickle Ghyll waterfalls just outside the car park at the start of the walk. Bright blue skies over Harrison Stickle. Mist and the morning frost down Great Langdale. Lingmoor Fell across Great Langdale. Calm waters at Stickle Tarn with the towering cliff of Pavey Ark directly ahead. My route; Jack's Rake, follows the diagonal ledge across the face of the cliff. You cant see them in the photo but there are three people currently about 1/4 the way up the Rake. Beautiful reflections of Harrison Stickle. The undulating ridge of Blea Rigg. My route - Jack's Rake. The tree at the top of the photo marks the half way point (and gets harder from then on). Looking down the first 30m or so to the bottom. Little bit of a tougher section as the rocks were a little wet in places - and I managed to catch up with the people I saw from when I was at Stickle Tarn. Pavey Ark summit cairn and view down Great Langdale to Windermere. The North Western Fells, the highest being Grasmoor which is on the left. Great Gable from Thunacar Knott. This time looking south-east towards Windermere. Now heading across to Harrison Stickle and I got this view across to Rossett Pike (where I will be later today) and Esk Pike. Great Langdale, now almost completely defrosted from Harrison Stickle. Pike O'Stickle and Mickleden from Loft Crag. Congratulations to the fellow walker sitting on the summit of Loft Crag having just completed the 214 Wainwrights. Time to continue across to Pike O'Stickle. And a view in the opposite direction from Pike O'Stickle. The Langstrath Valley with Eagle and Sergeant's Crag to the right and Blencathra in the distance. The Langdale Pikes, Lingmoor Fell and a shaded Mickleden from the aptly named Mickleden Cairn. Rossett Pike summit cairn. Time to follow the pony track down through Mickleden and back to Dungeon Ghyll.